OPEC, which has been exceeding its own oil-production cap during the past year, says output was down in October and forecasts a production drop overall next year because of the persistent low price of oil. The cartel’s Monthly Market Report, published Thursday, said its 12 members extracted an average of 31.38 million barrels of oil per day last month, down by 256,000 barrels per day in September because of export delays in Iraq and lower production in both Saudi Arabia and Kuwait. The report on OPEC’s production decline comes less than a month before the cartel meets on Dec. 4 at its headquarters in Vienna. Some producers have been calling for the group to abandon its price war with rival producers, particularly in the United States, and bolster the price of oil, which has fallen from more than $110 per barrel in June 2014 to below $50 per barrel today. Yet the report supports the opposing view: that the strategy, masterminded by Saudi Oil Minister Ali al-Naimi, is working precisely because OPEC is not only regaining market share it lost to rival producers, but also forcing those producers to extract less oil. Many of them rely on hydraulic fracturing, or fracking, to extract oil from shale, and can’t make a profit with the global price of oil so low. The October decline in OPEC output was greatest in Iraq, where production fell by 195,400 barrels per day. The country’s oil industry is hampered because the government in Baghdad needs money to fight the Islamic State and because of bad weather at Iraq’s main export terminal on the Persian Gulf. Still, Iraq produced a generous amount of oil in October of just over 4 million barrels per day. Related: Is The Oil Industry Really Subsidized? Elsewhere in OPEC, the group’s chief producer, Saudi Arabia, saw October production fall by an average 72,000 barrels to a little more than 10 million barrels per day. It was the second consecutive month that Saudi output had declined, following a surge during the summer months, when domestic demand for energy is at its highest. In Kuwait, meanwhile, production fell by an average of 44,500 barrels per day to 2.688 million barrels per day. 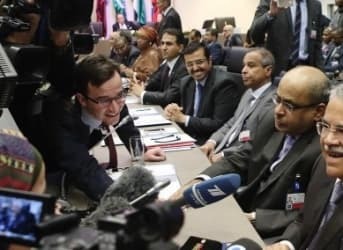 It was at its meeting in November 2014 that OPEC decided not to cut production to shore up prices but to maintain output at 30 million barrels per day. In fact, since then, the group has been exceeding that cap by an average of about 1.5 million barrels per day. Even with October’s drop in output, the report said, demand for its crude oil was 29.6 million barrels per day, less than the cartel produces. The report cited data from the U.S. Energy Information Administration that, because of the low price of oil, on-shore production is down with only one of the seven shale fields responsible for new oil production expected to increase output in December. “U.S. crude oil production, particularly tight oil output, reflects an oil price outlook that will weigh on oil rig counts,” the OPEC report said. In fact, oilfield services company Baker Hughes says the U.S. rig count for October was 791, a decline of nearly 7 percent from September and almost 60 percent lower than it was in October 2014. That drop may be offset by “strong growth” of oil production in the U.S. waters of the Gulf of Mexico. The report said production there rose to an average of 1.65 million barrels per day in October, an increase of 14.5 percent over October 2014.